THE NEW YORK Times’ Ken Belson and Mark Leibovich obtained audio from an October meeting between the NFL, owners, and players following President Donald Trump’s attack on the league over protests during the national anthem. In the wake of Trump’s comments saying players should be fired for protesting during the national anthem, several players and teams kneeled on the sidelines as the anthem played. However, as the controversy grew, the two sides met to try to resolve the issue, resulting in a contentious meeting as both sides argued about Trump, Colin Kaepernick’s unemployment, and the protests. Belson and Leibovich reported the meeting mostly consisted of owners talking over one another, painting the meeting as unspecific in its plan and unproductive. According to the Times, several owners expressed concern about Trump’s attacks on the league, citing fan boycotts, pressure from sponsors to stop the protests, and declining TV ratings. Buffalo Bills owner Terry Pegula said the league needed a “plan” for when Trump decided to attack them again. While the owners did not necessarily voice support for the protests, Houston Texans owner Bob McNair was reportedly more direct, telling players to ask others players to stop kneeling altogether. “You fellas need to ask your compadres, fellas, stop that other business, let’s go out and do something that really produces positive results, and we’ll help you,” McNair reportedly said. ESPN reported in October that McNair had said in a meeting just among owners that the league can’t have the “inmates running the prison,” referring to the protests. McNair initially apologised, but recently said he regretted apologising, because the meaning of his words was misconstrued. According to The Times, players brought up Colin Kaepernick’s unemployment. 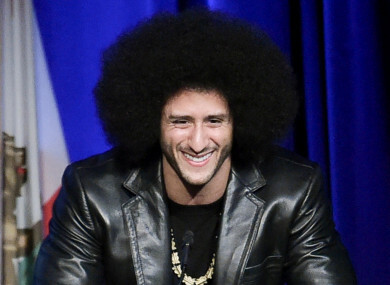 Eagles defensive end Chris Long said that some of the negativity around the league would not be going on if Kaepernick, who started the anthem protests, had been signed to a roster. Former San Francisco 49ers safety Eric Reid, who protested with Kaepernick, also reportedly said Kaepernick was “blackballed,” but did not receive much response from owners. Kaepernick is still a free agent and in the midst of a grievance against the NFL, accusing owners of collusion for keeping him unsigned. According to The Times, few proposals to fix the controversies surrounding the league were made, though, at the end of the meeting, the two sides released a joint statement saying the meeting was productive. “It would be good if you could work in the word ‘unified’ or ‘unity’ in some fashion,” Kraft reportedly said of the statement. “We could say simply, today we had a reset, and the players’ issues are our issues, and we recognise them and will work together,” the Miami Dolphins owner Stephen Ross said. While the NFL did agree to an initiative to donate to charities, organisations, and nonprofits that players support, the biggest issues seem mostly unsettled. Email “New report details how NFL owners and players bickered over Trump, Colin Kaepernick”. Feedback on “New report details how NFL owners and players bickered over Trump, Colin Kaepernick”.